Traveling with kids isn’t always the easiest endeavor. Luckily there are tons of kid-friendly resorts now that cater to families and include something for everyone. From spa packages for mom and dad, to a special gaming lounge for teens, to specialized kids camps, resorts have stepped up their game when it comes to welcoming families. Many resorts are also now all-inclusive, allowing you to get more for your money and take the stress of planning off your hands. Whether you’re looking for a once-in-a-lifetime experience for your family, or just a short luxury getaway, these resorts offer amazing family-friendly amenities and experiences. 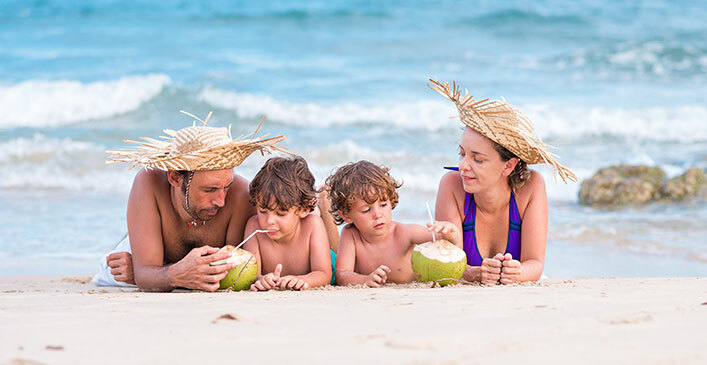 When it comes to outstanding service and awesome amenities, Beaches is the leader in family-friendly resorts. Their Turks and Caicos location offers an all-inclusive experience to create the ultimate vacation. Parents can hit the spa or go scuba diving in some of the most renowned reefs in the world. Kids can spend the day with their favorite Sesame Street characters or go to camp designated for their age group. There are an endless amount of activities to do including water sports, pizza parties, karaoke, arts and crafts, and boat tours. Families can play sports like tennis and volleyball together, enjoy the giant Pirates Island Waterpark, or relax and play some games in the Xbox Lounge. How’s that for all-inclusive! One of the oldest and most distinguished resorts in the Caribbean, Half Moon Bay offers luxury at a bargain. Famous guests have included Queen Elizabeth II, John F. Kennedy and Paul Newman, along with a host of other VIPs. Half Moon Bay has its own children’s village for kids aged six to 12. Activities include puppet shows, a wading pool, playground, video game room and bicycle rentals, among others. Teens can enjoy the Hype Zone, their own special hang out with game room, internet lounge, theme nights and spa services. Golf lovers young and old can also indulge in the golf academy, which offers one-on-one sessions, complete with video and computer analysis of your stats. Cheval Blanc St Barth is located on the island of St. Barthelemy in the French West Indies. The epitome of luxury, the resort caters to you and your family’s every whim and wish. Baby equipment and child-sized amenities are provided by the resort to ensure the comfort of your children. Children’s menus are also available at all restaurants on resort property or you can customize a menu for your child by choosing ingredients for the chef to prepare. Adults can enjoy everything from spa treatments to island tours, surfing to beach yoga, as the resort offers babysitting at your convenience. Their concierge team, called Alchemists, can arrange picnics on a desert island, romantic cruises, children’s painting classes, and snorkeling with a mermaid. The resort documents all family experiences in photo and video, which you can take home with you at the end of your stay. Disney is known worldwide for their family friendly theme parks, resorts, and cruises. Aulani Resort and Spa, on the island of Oahu, HI, provides an all-inclusive experience sprinkled with the magic of Disney. Fun for the whole family, Aulani has a variety of pools and water play areas, including a lazy river, infinity pool and splash zone. Children can enjoy complimentary beach games and sand castle building, organized by resort staff. Since no Hawaiian vacation would be complete without a little entertainment, the Starlit Hui offers hula performers, fire dancing, and Disney characters galore! Families can also enjoy nightly Disney films screened outdoors or gather round the fire pit for a puppetry storytelling experience. There is even a kid’s only activity center where children can learn about Hawaiian culture, play games and do arts and crafts. San Diego offers many family-friendly attractions such as Sea World, San Diego Zoo and LEGOLAND. The Loews Coronado Bay resort is located on its own peninsula off the coast of San Diego’s Chula Vista neighborhood. Three heated pools, including one just for adults, are available for your enjoyment and relaxation. Tons of poolside activities are also offered for kids of all ages including live music, raft races and more. A special “kids’ closet” houses toys, games, DVDs, and essential baby equipment, which are at the disposal of resort guests. Kids also get a complimentary gift at check-in and can even be enrolled in a special nature camp. Loews Coronado Bay Resort is even pet friendly too! Pets are pampered just like their humans with gourmet room service, special treats, and their own complimentary bowl and tag.